Conn. senators demand NRA ‘cease and desist’ making robo-calls to Newtown residents – NY Daily News. 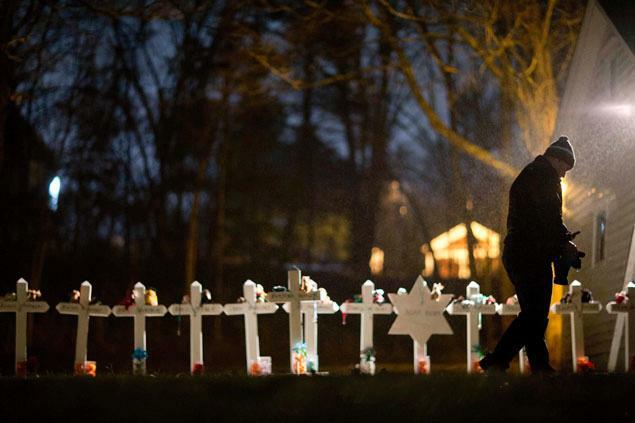 Frank Kulick walks past a display of wooden crosses and a Jewish Star of David representing the victims of the Sandy Hook Elementary School shooting on his front lawn. Democratic Harry Reid said last week that including the assault weapon ban in the gun control package would likely cause Republicans to block the entire gun-control package, including measures that have bipartisan support. In the meantime, the Americans who mourn the children of Newtown, Conn.; the victims of the Aurora, Colo. shooter; the three women who were shot down at the Azana Salon & Spa by Radcliffe Haughton; the 6 killed at the Sikh temple in Oak Creek and many others before them and how many more before 2013 comes to close are beginning to feel like the Washington political machine is spitting on the graves of those that have been buried thanks to shooters using assault weapons and other guns purchased illegally. Bloomberg pledges to create a permanent counterweight to the N.R.A. He said his new $12 million dollar ad campaign supports universal background checks and targets 10 senators in home states over the current 2-week recess. It’s intention is to draw out 90% of the public who support expanded checks. Bloomberg and the senators wants the ads to tell the public in those 10 states what people are doing in Congress … who’s voting for what. And then they can make their own decisions. In some cases, they have actually called Newtown residents. In this instance, I think the N.R.A. have pardon the pun… shot themselves in the foot. Lupica: Morbid find suggests murder-obsessed gunman Adam Lanza plotted Newtown, Conn.’s Sandy Hook massacre for years – NY Daily News. When the Sandy Hook shooting first happened I predicted that Adam Lanza’s mother Nancy, would hold the key to the tragedy. At a recent International Association of Police Chiefs and Colonels in New Orleans, Danny Stebbins, a colonel from the Connecticut State Police shared some startling facts about the Sandy Hook shooting. From an article written by Joe Kemp/New York Daily News dated Monday, March 18, Adam Lanza might have been trying to top all other mass murderers (records). Black paper over a classroom’s window spared an entire classroom of children, and caused Adam Lanza to bypass the room entirely. But it’s Colonel Stebbins comments from the recent conference that’s really frightening … law enforcement reportedly found a 7-foot-long, 4-foot-wide spreadsheet with names, body counts and weapons from previous mass murders. Adam Lanza was on a quest for notoriety. His mother, who was the first victim on his quest, was making straw purchases of guns for him all along and ignored the fact that he was getting more and more fixated on them. You should read the article in its entirety by clicking the link. Kim Kardashian, Kris Humphries divorce case heats up: Court documents show marriage scenes were ‘scripted, reshot or edited’ for reality show – NY Daily News. Now I can understand some editing of a reality show, but scripting and reshot is a huge no-no. But then we are talking about the Kardashians, aren’t we? Just so you know, this is one of the few times I will write anything about 1) a reality show of this low caliber and 2) the train wreck known as the Kardashians. Click on the link above and don’t be surprised by what’s reported. The train wreck is set to hit town again on May 6 when Kayne West’s baby mama is due in court again. Let’s just pray that there’s not a deal in the works for a reality show for the new couple. I don’t think there’s a network that stupid.